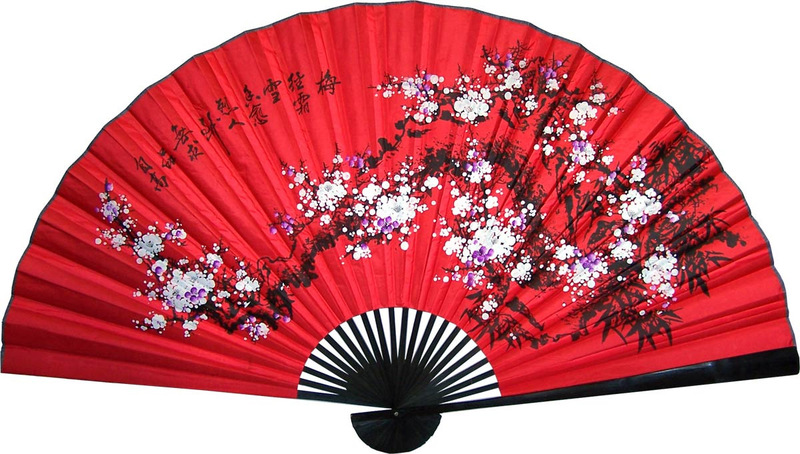 2 Prosperity Blossoms with Black Bamboo: this beautiful hand-painted Chinese wall fan depicts cherry blossoms amid an all-red background, which is symbolic of luck and prosperity in Chinese culture. Prosperity Blossoms with Black Bamboo: this beautiful hand-painted Chinese wall fan depicts cherry blossoms amid an all-red background, which is symbolic of luck and prosperity in Chinese culture. The cherry blossom is an important flower and symbol in Chinese and Japanese culture. It signifies feminine beauty and is also the symbol of love. The Chinese were the first to create large wall fans. They decorated their Chinese wall fans with various designs, such as flowers, landscapes, people, dragons, phoenixes and nature scenes. Now you too can enjoy the remarkable beauty and elegance of Asian-inspired decor with this authentic large wall fan from China. Available in 60″ size only.